At her practice, Stéphanie Coutas surrounds herself with a team of highly skilled professionals who specialise in luxury. From the interior design of the most beautiful homes to creating unique furniture, Aymeric describes the original nature of his profession and Stéphanie Coutas’s desire to give every project the same hallmark of exacting quality. How long have you worked with Stéphanie Coutas? I have worked with Stéphanie Coutas for over 10 years. One successful project leads to another and the team has gradually increased in size. Architects, interior decorators, designers, purchasing managers… from renovation to decoration, SC Edition incorporates every type of skill we need for our business. Stéphanie deals with communicating with customers personally. The way the practice is organised enables us to meet their expectations as closely as possible, by offering them precise, bespoke advice in every area. Over the past ten years, have technological developments changed your way of working ? I trained as a graphic artist and interior designer at the Penninghen and Camondo schools in Paris. Design remains at the heart of my profession. Of course, we make use of the latest professional software tailored to our business. As for the practice, it remains centred on the French high-end market. We work with luxury hotels, private mansions; the number of projects we have worked on is growing exponentially. In terms of interior design, how do you approach the projects entrusted to SC Edition ? The definition of the word project provides a direct answer to this question. It entails reflection, design and ensuring the material feasibility of a concept. We start with a key word, a colour, an encounter. The job of the practice is to understand how the customers live in their interiors; what it is that they want. These individual characteristics must be incorporated into our research and harmonised with the SC Edition style at the same time: it’s what our customers want to find in their interiors when they work with us. The practice’s projects combine decoration, art and luxury. What are the characteristics inherent to the luxury sector ? We do indeed work within a restricted area of our field of activity. Stéphanie expects a level of quality that is, quite simply, excellent. We have totally integrated this into our way of working; it has become the norm for our practice. The wider the field of possibility, the greater the need to make the right artistic choices. Thanks to the work of Stéphanie Coutas and the practice’s team of interior decorators who closely follow the latest trends, materials and new ways of handling them, we are able to revisit every style, while at the same time retaining a consistent look. And this is what SC Edition does best. The agency collaborates with numerous artistic craftsmen. At what stage of the creative process do they get involved ? We surround ourselves with the best right from the design stage. Marble specialists, cabinetmakers, carpenters, etc. offer extremely helpful advice. 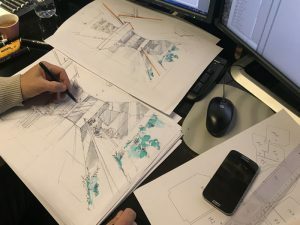 Starting with a sketch, a floor plan, we work together on any possible difficulties before creating a flawlessly finished product. Stéphanie Coutas has been producing furniture and decorative items for three years. What are her sources of inspiration ? Stéphanie loves sensations, touch, visual appeal, the harmony of forms. The entire team works together, using her new ideas, a reference image or material as a basis. A successful piece is one that makes you want to look at it and touch it. How would you define the essence of these collections ? From pure design to collaboration with major Parisian brands such as Baccarat, every piece carries the practice’s signature. They all meet the same criteria of exacting standards and originality and take a whole year to develop, from design to production. It’s a perfect marriage of design and haute couture.